Saint-Laurent-sur-Mer is a commune in the Calvados department in the Normandy region in northwestern France. Satisfy your inner culture vulture at Omaha Beach and Pointe du Hoc. Visit American Cemetery & Memorial and German Cemetery La Cambe for their historical value. You'll find plenty of places to visit near Saint-Laurent-sur-Mer: Church of Angoville-Au-Plain (in Angoville-Au-Plain), Batteries de Crisbecq (in Saint-Marcouf) and Airborne Museum (in Sainte-Mere-Eglise). There's much more to do: take in the history at Musee du Debarquement Utah Beach, contemplate the long history of Église Notre-Dame de Sainte-Marie-du-Mont, take in the architecture and atmosphere at Eglise Saint-Aignan, and learn about all things military at Overlord Museum - Omaha Beach. To find photos, other places to visit, ratings, and more tourist information, use the Saint-Laurent-sur-Mer trip itinerary maker . Newcastle upon Tyne, UK to Saint-Laurent-sur-Mer is an approximately 11-hour car ride. You can also fly. Traveling from Newcastle upon Tyne to Saint-Laurent-sur-Mer, you'll lose 1 hour due to the time zone difference. Traveling from Newcastle upon Tyne in April, you will find days in Saint-Laurent-sur-Mer are a bit warmer (17°C), and nights are about the same (6°C). Wrap up your sightseeing on the 18th (Thu) early enough to travel to Barfleur. Barfleur is a commune in the Manche department in the Normandy region in northwestern France. Deepen your sense of the past at sights like Eglise Saint Martin and Le Phare de Gatteville. 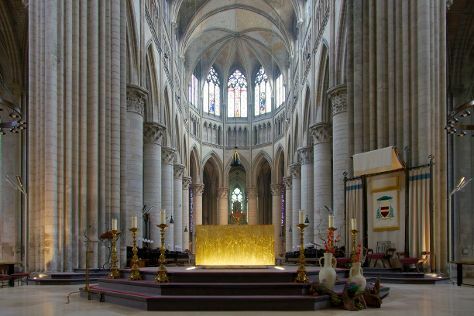 Your cultural itinerary includes sights like Eglise de Brix and Chapelle des Marins. Explore Barfleur's surroundings by going to Orglandes (Cimetiere Militaire Allemand & German War Cemetery), Chateau de Crosville-sur-Douve (in Crosville-sur-Douve) and Eglise Saint-Pierre (in Saint-Pierre-Eglise). And it doesn't end there: make a trip to Eglise de Montfarville, take in the spiritual surroundings of L'eglise de Saint-Vaast, pause for some serene contemplation at La Chapelle des Marins, and examine the collection at Moulin de Marie Ravenel. Plan a Barfleur trip in moments using our itinerary builder. Drive from Saint-Laurent-sur-Mer to Barfleur in an hour. In April in Barfleur, expect temperatures between 14°C during the day and 7°C at night. Finish your sightseeing early on the 21st (Sun) to allow enough time to travel to Mont-Saint-Michel. Le Mont-Saint-Michel is an island commune in Normandy, France. Deepen your sense of the past at sights like Mont Saint-Michel and German War Cemetery Marigny. Get some cultural insight at Cimetiere Militaire Americain de Saint-James and Eglise Saint-Quentin. 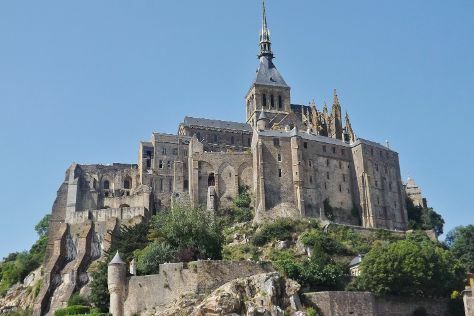 Explore the numerous day-trip ideas around Mont-Saint-Michel: Musee 44 La Percee du Bocage (in Saint-Martin-des-Besaces), Prison Royale (in Tinchebray) and La Fosse Arthour (in Saint-Georges-de-Rouelley). The adventure continues: get great views at Pointe D'Agon, enjoy the sand and surf at Beach of Genets, don't miss a visit to Chateau de Gratot, and stroll through Plage, Agon-Coutainville. To find other places to visit, reviews, and tourist information, read Mont-Saint-Michel trip planner . You can drive from Barfleur to Mont-Saint-Michel in 2.5 hours. In April in Mont-Saint-Michel, expect temperatures between 17°C during the day and 6°C at night. Wrap up your sightseeing on the 28th (Sun) to allow time to travel to Alencon. Alençon is a commune in Normandy, France, capital of the Orne department. Get some cultural insight at Parc des Forges de Varenne and Eglise Saint-Ceneri de Saint-Ceneri-le-Gerei. Deepen your sense of the past at sights like Cathedrale Notre-Dame de Sees and Chapelle du Petit Saint Ceneri. Venture out of the city with trips to Manoir de Courboyer (in Noce), Sanctuaire Notre-Dame de Montligeon (in La Chapelle-Montligeon) and Chateau of Carrouges (in Carrouges). There's much more to do: explore the historical opulence of Château d'Ô, pause for some serene contemplation at Eglise Saint-Germain, don't miss a visit to Chateau de Domfront, and take in the spiritual surroundings of Maison Natale de Sainte Therese. For photos, ratings, where to stay, and more tourist information, go to the Alencon online sightseeing planner . Drive from Mont-Saint-Michel to Alencon in 2.5 hours. April in Alencon sees daily highs of 19°C and lows of 7°C at night. Wrap up your sightseeing on the 4th (Sat) to allow time to drive to Deauville. Your inner history buff will appreciate Bayeux War Cemetery and Pegasus Memorial (Memorial Pegasus). Visit Deauville Beach and Plage de Trouville for some beach relaxation. 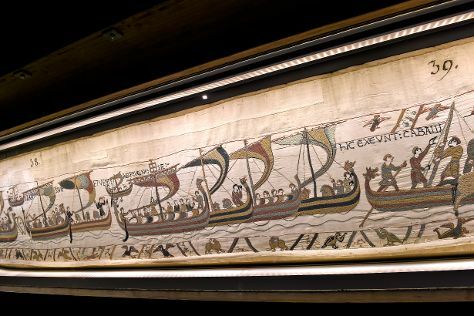 Venture out of the city with trips to Bayeux (Cathedrale Notre-Dame & Musee de la Tapisserie de Bayeux), Plages de Houlgate (in Houlgate) and Les Halles Medievales (in Dives-sur-Mer). There's much more to do: brush up on your military savvy at Memorial de Caen, tour the pleasant surroundings at Promenade Marcel Proust, stroll the grounds of Beny-sur-Mer Canadian War Cemetery, and contemplate in the serene atmosphere at Saint Catherine's Church. To see photos, reviews, other places to visit, and other tourist information, go to the Deauville day trip planner. Getting from Alencon to Deauville by car takes about 2 hours. Traveling from Alencon in May, expect nights in Deauville to be about the same, around 9°C, while days are little chillier, around 19°C. Wrap up your sightseeing on the 12th (Sun) early enough to drive to Rouen. Your cultural itinerary includes sights like Cathedrale Notre-Dame de Rouen and Musee des Beaux-Arts de Rouen. Your inner history buff will appreciate Abbaye de Jumieges and Eglise St-Joseph. Get out of town with these interesting Rouen side-trips: Plage Du Tilleul (in Le Tilleul), Falaises d'Etretat (in Etretat) and Fondation Claude Monet (in Giverny). There's lots more to do: enjoy the sand and surf at Plage-Baignade Yport, explore the different monuments and memorials at Cimetiere Saint-Sever, contemplate the long history of Palais Benedictine, and make a trip to Abbaye de Bonport. For where to stay, traveler tips, and more tourist information, read our Rouen road trip site . Traveling by car from Deauville to Rouen takes 1.5 hours. Alternatively, you can take a train; or do a combination of bus and train. In May, daily temperatures in Rouen can reach 20°C, while at night they dip to 8°C. Cap off your sightseeing on the 18th (Sat) early enough to travel back home.